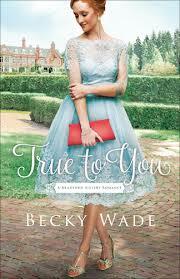 Becky Wade has started a new series about three sisters and her first book, True to You, came out this week. I could not wait to read it and cracked it open yesterday. I could not put it down:) Here's a short blurb, and we'll chat on the other side. Wade has opened this new series with a new style. There is something fresh and yet familiar with her writing, and it was that juxtaposition that I loved! From the first pages this book reads unlike any other Wade book, and yet her voice is evident. Wade remains a master at believable chemistry and pacing between her characters. Her heroes have her signature voice all over them, and that remains true in True to You. She also maintains the beauty of family in her book, only this time it's with three sisters. While never perfect relationships, the bond of a family is something she keeps in tact, which is refreshing. And her faith element is woven in organically, another piece Wade seems to do effortlessly which can only stream from her own love of God. It's simply a part of her, so it's a part of her writing. What's new is her style of writing. She's introduced small snippets of emails and texts which allow us to see pieces of background information in unique ways that don't stall the progress of the story but rather enhance it. And even her wording and beats are different here, creating a unique flow to the story that completely suits these new characters. And yet, it's still 100% a Wade novel. This, to me, is the mark of an amazing author, and Wade is most definitely one of those. As for the meat of the story itself, I thoroughly enjoyed Nora and John. Pairing a historian with a Navy Seal brought about some fun moments. And the fact that these two established a friendship first allowed only had me rooting for their relationship all the more. I happily give True to You 5 out of 5 stars and you can purchase it here. I can't wait to get this book and read it. I'm helping my son and his wife pack up to move to Waco, Texas and need a fun story. This sounds like it'd be perfect. Thanks for sharing!